This amazing 2 bedroom 1.5 bath single story home has been remodeled and fully upgraded! It measures 1,178 square feet, while sitting on an over-sized lot measuring 7,000 square feet. 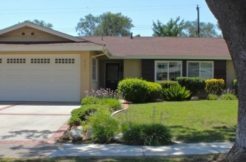 This home features great curb appeal including landscaping with an automatic irrigation system, a lengthy driveway, new exterior and interior paint throughout, a new premium roof, and new retrofit foundation. The front entry leads you to a light & bright floor plan that will work for all your family’s needs! The interior features brand new hard flooring, new doors throughout, new light fixtures throughout, new dual pane premium vinyl windows, new central air-conditioning & heating & so much more! Separate living room, dining room & kitchen with a half bath just off the dining room make this a great space for entertaining. The new custom kitchen is immaculate with new premium cabinets, quartz marble counter tops, a stainless steel colored dishwasher, a stainless steel colored stove, a stainless steel colored microwave, new fixtures and designer back-splash. The fully upgraded bathrooms offer brand new vanities, toilets, light fixtures, tile, a tub and plumbing. The large backyard is fully fenced with a one car garage and a new garage door.